Sandy Fussell‘s new picture book had a most timely arrival, with Christmas around the corner it comes as an important reminder that responsibility for pets is for a life time, not just for one season. Already having success with her middle grade books, including the popular Samurai Kids series and her award winning novel, Polar Boy, Sandy Fussell‘s venture into picture book territory is exciting, and certainly most welcomed. 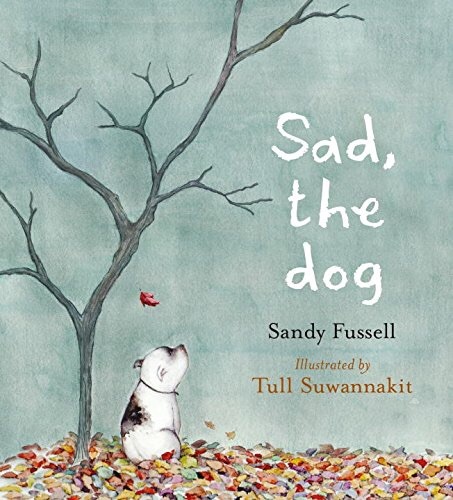 I look forward to sharing our interview with you as the talented, animal-loving Sandy Fussell talks about her career and her gorgeous new title, Sad, the Dog. For me, and my daughters, Sad, the Dog has had a lasting affect on us. Having always had (spoilt!) dogs in our family, it is unimaginable the level of ignorance and treatment that Mr and Mrs Cripps place on their dog; an unwanted ‘nuisance’ they were given for Christmas. Starved for affection, and even a name, this little pup, who’s spirit is inexorably crushed, calls himself ‘Sad’ – unfortunately, an apt name. But when the grouchy owners up and leave, without so much as a bat of an eyelid, poor Sad is left to fend for himself. In a seredipitous turn of events, Sad is united with a new friend, a new family, a new name, and a new spirit. Fussell’s eloquent language, together with Tull Suwannakit‘s characteristically arresting illustrations, have the irrefutable power to elicit a full range of sensations with every read. I honestly can’t remember many books that have had me bubbling with rage, sorrow, optimism and pure joy all at once. Through the sadness, though, you’ll find those pops of warmth and love. Sad, the Dog is emotionally and visually striking, highly memorable and absolutely endearing that any child (and adult) would be ‘lucky’ to own. Read Dimity‘s insightful review here. Thank you, Sandy for talking with me today! 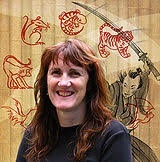 You’ve been successful with your middle grade fiction, and in particular your best-selling ‘Samurai Kids’ series. What made you venture into the world of picture books and how would you compare your processes between the different writing styles? Do you prefer one style over the other? I never intended to write a picture book and if anyone had asked me, I would’ve insisted it would never happen because I don’t look at the world through “picture book eyes”. But one day, I accidentally looked that way, and the story of Sad the Dog appeared inside my head (450 words complete with a plot hole!). My approach to middle grade and picture books is exactly the same. I let the story tell itself. When the sense of place and character is strong, the story always follows. While I don’t prefer one over the other, I find middle grade a lot easier to write (the picture book eyesight problem again). What I did find very different and quite wonderful, was that with a picture book, I was never on my own. Whatever I was doing, Tull Suwannakit (who illustrated Sad) was keen to share and support and vice versa. When you write a picture book there is always another person who loves it exactly as much as you do. ‘Sad, the Dog’ is loosely based on a true story of a neighbouring family in your past. What does this story mean to you? What significant messages do you hope readers will gain from reading your book? This question of messages in books interests me – Are they really there? Do they matter? What if readers get them wrong? I’ve heard many authors (especially adult fiction) say they don’t write with books with a message. For me, that’s not possible. A writer brings many themes to a story – from their passions, beliefs and experiences – they’re story building blocks. And themes inherently contain a message. The reader may find completely different themes and messages depending on their life experience and perspective, and I’m fine with that too. Sad the Dog, is about hope. Life can be very sad, but with a little help, it can be turned around. There’s other messages too. If we help others we make the world a happier place. Owning a pet involves an emotional responsibility as well as providing the physical needs of food, water and somewhere to sleep. I could probably find even more messages if I went looking. My world view seeps into all my stories, long or short. What have been your most rewarding and challenging aspects of creating books, and in particular, ‘Sad, the Dog’? For me, the story itself is a wonderful reward. I suspect I am a very selfish writer. I write the stories I want to tell and the stories I want to hear. The challenge is convincing others these stories are worth reading and sharing. School visits are the ultimate challenge and I’m always up for that. If I can inspire one child in every school to look at books more positively – that’s a huge reward. The other big reward I associate with creating books is meeting book people – whether they are readers, writers, librarians or booksellers – anyone who wants to talk books is an instant friend. I’ve been part of the Oz literary landscape for a few years now but writing a picture book introduced me to even more book people. The artwork by Tull Suwannakit is quirky, compelling and absolutely sublime. What do you like about his work and how do you feel his illustrations compliment your text? Do you have a favourite image from the book? I have to admit when I was first shown a drawing of Sad, I shook my head and said “Sad doesn’t look like that.” But the truth was, as I soon discovered, I didn’t know what Sad looked like and luckily for me, Tull did. 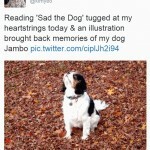 My image was a memory of Cassie, the floppy-eared soulful-eyed spaniel type dog who was the inspiration for the story. What I didn’t realise was after I reworked the inspiration into a story, it wasn’t about Cassie any more. It was about Sad. And Sad didn’t look like Cassie, he looked like himself. Which is what Tull knew right from the beginning. His illustrations were a perfect fit. I love Tull’s artwork and I love how art pervades his life. I feel lucky to be part of it. RMIT did a short film about Tull and his art. 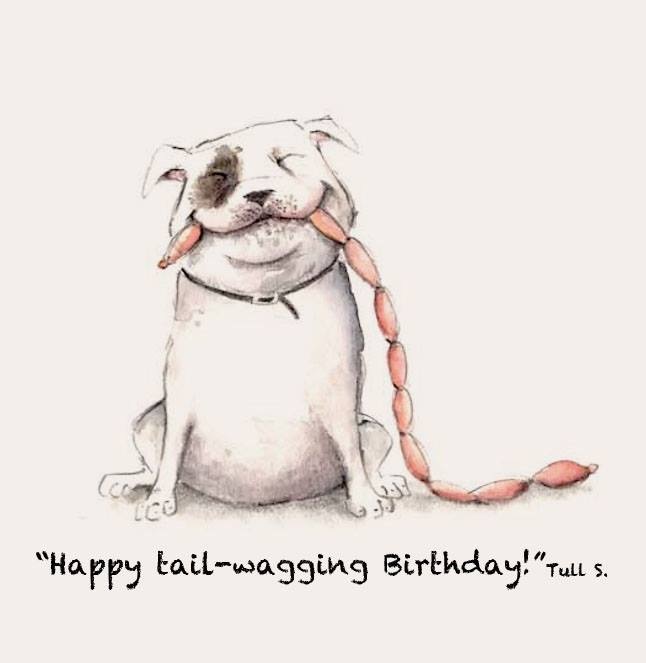 One of my Sad, the Dog favourite things is the birthday card Tull drew for me – Sad has a big grin and mouth full of sausages. My favourite illustration – and it’s so hard to choose – is the front cover with Sad sitting in the leaves – the colours are glorious and the fallen leaves, while leaving the tree bare and barren, remind me it will grow green again. In a wonderful coincidence of life imitating art, a friend on Twitter sent me this picture of her dog (who wasn’t sad but very happy). How did you find your publishing experience with Walker Books? How did you go about approaching them with your ‘Sad, the Dog’ manuscript, and how have they supported you in the process? I read an extract from White Crane at a meeting of writers that included Sue Whiting who had, unknown to everyone there, just been appointed Commissioning Editor for the new Walker Books Australian list. Prior to that Walker Books Australia was a distributor of Walker Books UK and Candlewick US titles. Sue asked me if I would send her the manuscript when it was finished. I did and I’ve been sending Sue manuscripts ever since. 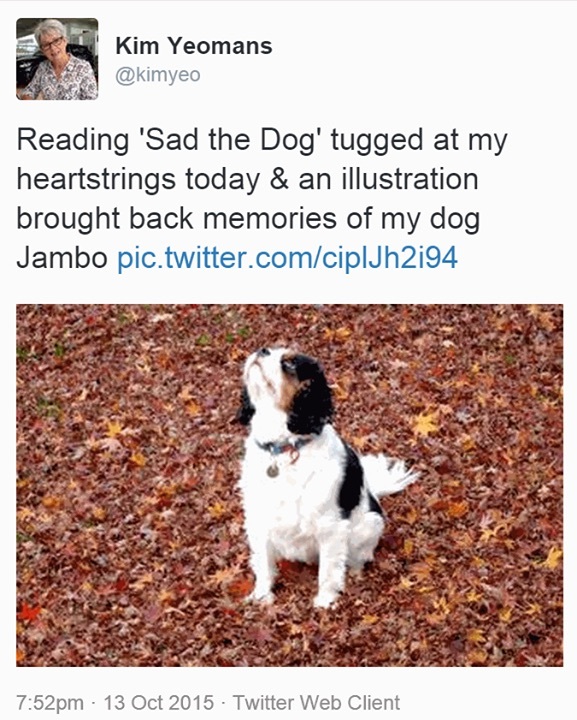 By the time I had the idea for Sad, the Dog I had already published five middle grade titles with Walker Books, whose name is synonymous with beautiful picture books. So I was thrilled when they accept Sad for publication. How have you found the response to ‘Sad, the Dog’ so far? Any stand-out moments or particular comments that have resonated with you the most? The response to Sad has been overwhelmingly positive and I’ve had lots of messages and pictures sent to me via social media. Samurai Kids is a popular series and I’m fortunate enough to still receive fan mail seven years after the first book – but they’re always email. Many responses to Sad are more spontaneous – photos and shout-outs. I’ve wondered if it’s a “picture book thing.” Adult picture book lovers are a vocal group – whether they love the book personally or because their child does – they seem more inclined to tell the world about books they love. I’m rather partial to these lines from a review on Brona’s Books blog: When I read picture books I tend to wear two hats – my preschool teacher’s hat (will a rowdy group of preschoolers like this book? What are its educational possibilities?) and my book lovers hat (do I love this book?) In recent years I have also added a third and fourth hat – my bookseller’s beret (will this book sell? Who to?) and my blogger beanie (does this book have review potential?) 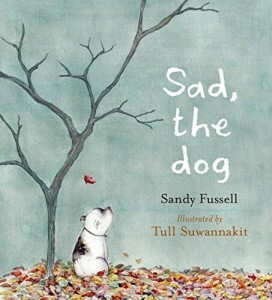 Sad, the Dog by Sandy Fussell is one of those special picture books that I can answer YES, YES, YES to all the above. What author wouldn’t love to hear that said about their first picture book? Do you / have you owned a pet of your own? What special moments with your pet/s can you recall the most? Currently I have two chocolate-point Burmese cats (Bree and Tega) and a green tree frog called Fat Boy Slim. Over the years I’ve had many pets – some have been rescues and returned to the bush (Mouse, the baby possum given to me by a Ranger when I worked at the Royal Botanic Gardens, Robert the cockatoo with an injured wing) as well as numerous parrots (Robert liberated those), tankfuls of tropical fish (discus and hatchet fish are my favourites), a budgerigar, ducks, chickens, a lizard, a turtle, snakes and three Scottish deerhounds. 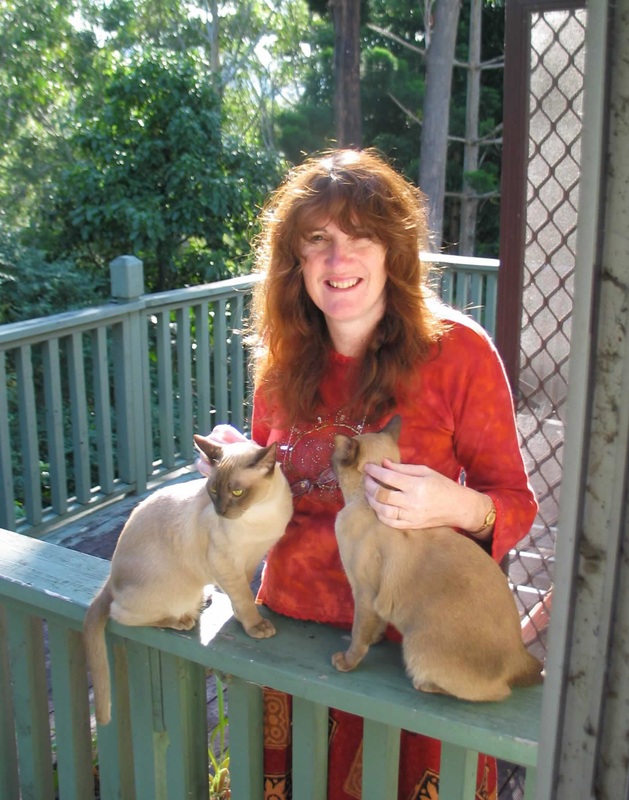 My pets, especially the dogs and cats, are family members, much more than just animals that live in my house and yard. Sad, the Dog was inspired by my indignation that anyone could abandon their dog to the new owners of their house, as if a pet was some sort of inanimate home fixture. Have you always wanted to be a children’s writer? What motivated you to pursue this career? How did you get your break? I always loved reading but I never wanted to be an author of any kind. I was into mathematics and IT. Finding I wanted to write for children was an accident. My avid-reader 10-year-old decided overnight he wasn’t going to read any more. I’ve always believed the key to kids reading is finding the right thing to read (which may not be a book). I managed to convince him to write me a story that he would like to read. He insisted I transcribe it, because while storytelling was fun, writing it down was hard work (he was right about that). It was the most random story I’d ever heard and I kept interfering. So he sent me away to write my own story. By that time, I was hooked. I kept writing because I loved it. I wrote nine middle grade stories before I decided I wanted to share them. A chance meeting with Di Bates, who is one of most generous and knowledgeable people in the OZ children’s literary industry, fast-tracked my path to publication. Di encouraged me, improved my work and made sure I was standing in the right spot when opportunity found me. One of my career highlights is the speech I gave at the NSW CBCA dinner where Di was presented with the Lady Cutler Award for Services to Australian Children’s Literature. What valuable writing and publishing tips have you learned along the way that have been the driving force to getting you to where you are today? 1 Writing is a habit. Write and the story will come. 2 Words are the musical notes that make a story sing. Choose every one of them carefully and polish sentences until they shine. 3 Writers need other writers. And illustrators. And book people. Because they understand. 4 A writer needs to read widely inside and outside their comfort zone to develop their writing potential. 5 Your editor is your story’s best friend. Trust her (him) with it. 6 It’s important to give. It’s good for the soul. It makes for a better person and a better writer. You juggle your time between writing, blogging, presenting, and running several literary initiatives including The Story Crowd and The Reading Stack. What are your secrets to managing all these jobs? I think the truthful answer might be a bit boring. I’m not a good sleeper so I have more hours in my day than most people. I know it’s not supposed to be healthy to sleep 5 ½ hours a day but despite my efforts, I can’t change that pattern. My mother and grandmother were the same so perhaps it’s genetic. I’m also a very efficient person and the theory of productivity fascinates me. I’m always reading articles about it. I’m very focussed – some would say fixated and obsessed– and always full of ideas. I tend to act on a lot of them when I think most people have equally wonderful ideas but just keep thinking about them. If I’m not doing two things at once, I’m looking around for something else to do. Finally, tell us something about yourself that not many people would know! I spent years learning the violin. I’m still not very good at it so perhaps that’s best kept secret. You can find more on Sandy Fussell at her website and facebook page.